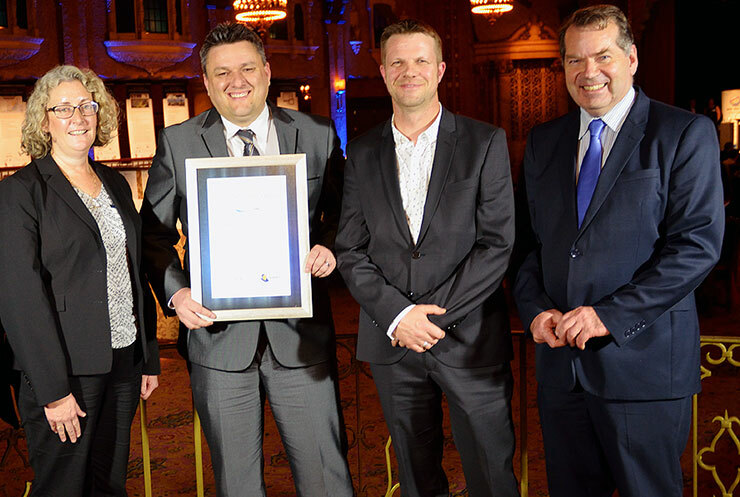 Federation University Australia’s Centre for eResearch and Digital Innovation (CeRDI) has won two major awards at the 2016 Victorian Spatial Excellence Awards, announced at a recent gala dinner in Melbourne. 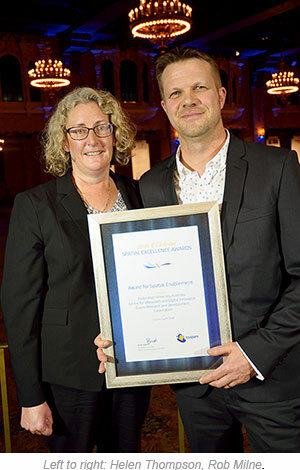 CeRDI and its partners won the Award for Environment and Sustainability for the Corangamite Natural Resources Management (NRM) Planning Portal and also won the Award for Spatial Enablement for Online Farm Trials. “I congratulate other winners and finalists in the Victorian Spatial Excellence Awards” Associate Prof Helen Thompson, Director of CeRDI, said. “We are very proud of the spatial and knowledge management research we undertake and I acknowledge and thank my CeRDI colleagues who have been involved in these successful projects”. “We are committed to working with industry partners to deliver digital and online innovations that support and enhance their work practices. These awards recognise the achievements of CeRDI and its strong and collaborative ties with industry to effectively utilise the latest innovation and spatial technologies to transform industry knowledge”. The details of the winning CeRDI projects are below. Left to right: Helen Thompson, Chris Pitfield (CCMA), Rob Milne and Gavan Mathieson. Landcare Groups in the Corangamite Catchment Management Authority (CMA) region are adopting a planning model which could revolutionise how communities work together to care for our environment. The NRM Planning Portal promotes regional and local knowledge sharing with intuitive and easy to use tools developed to spatially capture local priorities. It enables Landcare networks and partners to form their own local plans, to share and gain access to information and to come up with joint priorities which have the best potential for funding. Web-based geospatial technologies are empowering Landcare networks and community groups, improving project planning and reporting, supporting communication of agreed landscape zone priorities and enabling long term research, data capture, monitoring and evaluation. Partners on this project include the Corangamite CMA and 11 Landcare Networks in the Corangamite region. Farm trials have been a part of Australian farming for many years. Often run by local grower groups on behalf of agricultural communities, by government, research organisations and private industry. Farm trials help farmers improve farming productivity and sustainability. Up to this point hard copy trial results in the form of annual research reports have been produced. The Online Farm Trials project changes everything by making farm trial research available online in a way that can be explored spatially, via sophisticated filtering mechanisms in ways that are decision useful to agronomists and growers. The Grains Research and Development Corporation is the industry partner and project funder of OFT. To conclude, Assoc Prof Thomson commented that “As Victorian winners, Online Farm Trials and the NRM Planning portal now proceed as finalists in the Asia Pacific Spatial Excellence Awards which will be held in Sydney at the Locate17 Conference in April 2017”. For further information about these awards contact Assoc Prof Helen Thompson.